I have intentionally avoided talking about anything personal on my blog. But that is changing today. If you have read my bio you will have a small understanding of where we are in life. However, I am writing this now to ask for your prayers. it) and therefore has many restrictions on life. He can not play in the grass or dirt. Swimming pools are out of the question. Church isn't even a possibility for him at the moment, too many kids with too many germs. Although this season of our lives is unbelievably dreadful, it could have been much worse. In January 2014 Washington State began screening for SCID with their newborn screening. Ezra is the first baby born in WA State that tested positive on the newborn screen. (See links below for media stories.) 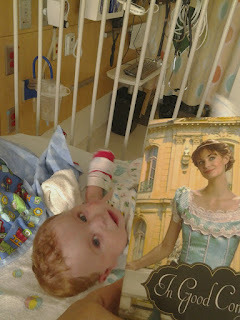 Seattle Children's Hospital along with Seattle Cancer Care Alliance came up with a game plan for Ezra. He underwent chemotherapy at 8 weeks old and had the transplant a week later. There were a lot of risks going in and we had to deal with some nasty side effects. But the alternative was to wait for Ezra to get sick and die. Transplant was successful, but he has had continuous problems with rashes and throwing up. Signs of GVHD but not necessarily the sole cause. We are currently admitted because his sodium was extremely high. We have been able to bring it down, but there is no knowledge as to why it was so high in the first place. Fluid intake was fine and salt intake was normal. He also tested positive for a urinary tract infection. Depending on the specific bacteria that is growing will determine if there are any oral antibiotics he can take. If he needs IV antibiotics, we will be here for another 7 days. My husband Zach will take Judah home on Friday (since we were planning on being here until Friday anyways) and will come back next week to pick me and Ezra up. The doctors have had to do a lot of guessing and trials with medications. It is frustrating and all I want is for my baby to be well and whole. If you think about us please send up a prayer for Ezra and our family. I truly believe that the Lord has great plans for little Ezra. His name means "Help"(yes The Beatles song is his song). Who would have known that not only would he need so much help in the beginning of his life, but that he would be bringing help to so many others. He truly is a pioneer in the medical field and he encourages me every day to live life to the fullest and to cherish each moment. If Ezra's story touches you at all, I ask that you please consider becoming a donor. Getting on the Bone Marrow Registry is very simple, you swab your mouth with cotton and mail it in. Be the Match is a great organization, I highly recommend going through them. Fred Hutchinson Cancer Reseach Center was also involved with Ezra's care.